"Feather needs the bird, the air"
Here's one of those cases where my musical selection can be considered redundant, since Haibane Renmei's own soundtrack was quite captivating in itself, but I digress. Frequently. Also, while the instrumentation in that soundtrack was wonderful, the few English lyrics left a lot to be desired. Cheaply animated but lovingly detailed as static drawings, the series contains exactly two bad scenes. The first is in the very first episode, the hatching scene, which went a bit heavy in its standard anime tropes of distorted faces and over-emoting. The second comes much later on, when Rakka collapses in tears by the side of the road. Too abruptly overly-dramatic. Aside from those three minutes or so, though? 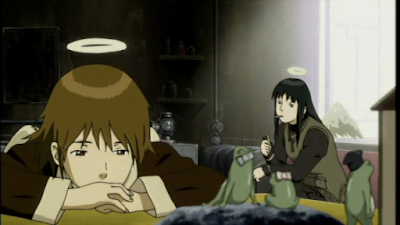 Haibane Renmei was brilliant, and has more than earned its place as one of westerners' main gateway drugs into -good- anime alongside Ghost in the Shell, Studio Ghibli's old movies and Cowboy Bebop. And this is what it mostly consists of: teenage girls with wings and halos sharing quiet, soulful conversations in dusty rooms of stained, faded concrete. Old books, old customs, old clothes, old walls, old youngsters bearing old wounds. Old Home. It's beautiful. It's slow. Probably the main thing you'll notice. Haibane Renmei progresses so subtly, so gradually as to make you question whether anything is happening at all. Fans of mecha mayhem and whirlwind planetary romances will have to settle for such "action" scenes as tidying messy rooms, picking up pancakes at the bakery and riding a bike - too fast! The most painfully mundane, hyper-realistic slice of life scenes mesmerize thanks to their contrast with the protagonists' other-worldliness. By the time Rakka washes her halo in the sink, the viewer's already prepared to empathize. Yet still, somehow, information accumulates. Drip, drip, drip. Much of it has to do with the nature of Glie, the walled town which serves as the story's setting. Some years after I watched Haibane Renmei, I picked up my first Haruki Murakami book - as should happen it was Hardboiled Wonderland and the End of the World, and immediately recognized the source of inspiration for Glie, as Yoshitoshi Abe himself confirmed if I'm not mistaken. Aside from a few superficialities however, the two are almost diametrically opposed. Unlike the contracting solipsistic finality of The End of the World, Glie is place where time and experience accumulate, where guidance is sought and freely offered. I could go into spoilerific detail about the individual "feathers" as the plot consists largely of the interplay of their personalities. As I've mentioned in the past I'm a sucker for broken little girls, so this series could likely moe me into submission without the benefit of a captivating setting, but it just wouldn't be the same. It was created with an obvious sense of nostalgia for idealized traditionalism, for functional, stable social systems. Old Home and the rest of the town emanate that good ole' musty gemeinschaft rightness and purpose, kalon chiseled by generations into the walls and cobblestones, a place of healing where shooting stars can root themselves for a while. Be patient. Let the drops accumulate, episode by episode, until understanding comes naturally. Pay special attention to names and don't expect full disclosure. Bask in the bittersweet sense of loss and decay and the melancholy string quartet score. This is not what you think of when you think of anime... but in many ways it's what animation could and should encompass. I'll talk about names and symbolism some other time. For now, set five or six hours aside to watch Haibane Renmei. If you have the patience for it and at least as much empathy as a lone, rabid wolf-man, you won't regret it. If nothing else, you'll always remember Reki and the three meanings of a name. P.S. - I should not have to give this warning but as everyone should know, get yourself a subtitled version. Never watch dubbed anime.